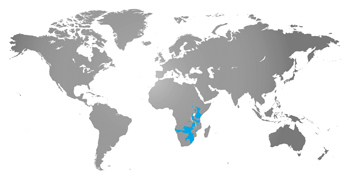 Zebras live in the savannahs and grasslands of eastern Africa. Zebras are herbivores, so they eat primarily grasses and leaves. The zoo provides high-nutrient grain, grass and hay to the zebras. The zebra’s fur is dull white with broad, brown to black stripes. This zebra species has broader and fewer stripes than many other zebras. No two zebras have the same exact pattern of stripes. Zebras live in herds of a single male and up to six females. They work as a herd to defend their herd from lion, hyena and other predators. Zebras communicate by facial expressions and sounds and have excellent hearing. They can run up to 40 miles per hour when necessary. Zebras give birth to one young, called a foal, every 2-3 years.